calms and relaxes reddened, dry or stressed skin. Eira’s efficacy and tolerability have been proven through product testing. 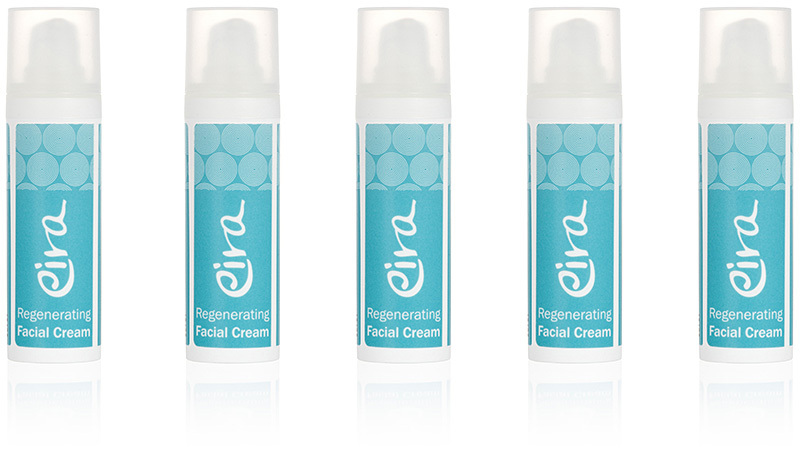 Eira makes skin look and feel healthy, radiant and counters signs of premature aging. Protective barrier: Eira contains organic shea butter, organic jojoba oil and plant-based squalan which strengthen the skin barrier and provide protection against outer, environmental factors while being gentle and well tolerable. Natural cell protection: Eira Regenerating contains mucor racemosus extract and tocopherol which help the skin deal with UV rays and act as free radical inhibitors. This prevents premature skin aging. For sensitive skin: Eira nourishes the skin without disturbing its natural balance. This is important as too frequent, rich or perfumed care can lead to skin irritation. COSMOS guarantees that our product’s quality. The patch and application tests guarantee our product’s tolerability and efficacy. Patch test/tolerability lead to no skin irritations and therefore proves Eira Regenerating is very tolerable. 4 week application test lead to no skin irritations, hydration improvement of Ø 29,8% and roughness reduction of Ø 30,58%. As a manufacturer of natural cosmetics we not only take care that our ingredients are sustainable but also that our packaging is. That is why our outer packaging is made of recycled carton. The product container and the label are made of recyclable PP, so that you do not have to separate the two before recycling them. Additionally, the material is light. This helps reduce CO2 emissions during transport. We compensate the remaining CO2 emissions because we want to do our part in keeping the earth healthy.